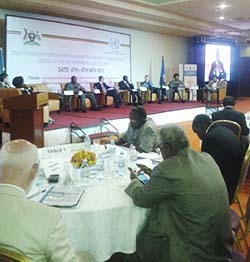 The UN Development Cooperation High-Level Symposium was held in Kampala, Uganda, from 4 to 6 November, 2015. It provided the first opportunity- following the adoption of the 2030 Development Agenda and under the UN auspices- to discuss the implementation of the Sustainable Development Goals. The 2030 Agenda, a new global agenda for sustainable development, and the Addis Ababa Action Agenda, a financing framework, were both agreed and adopted this year. Development Cooperation remains a strong pillar for achieving the Sustainable Development Goals, especially at local level and the symposium offered a chance to discuss development cooperation for the 2030 Agenda. UN DCF "To go More Local"
A delegation of local and regional leaders represented by UCLG Champions and UCLG took part in the Forum, including Mr Tunç Soyer, Mayor of Seferihisar (Turkey) and UCLG Champion; Ms. Nomveliso Nyukwana, Mayor of Emalahleni (South Africa) and UCLG Champion; Mr Youssouf Diakité, Executive Director of the Association of Municipalities of Mali; Ms. Rose Gamwera, Secretary General of the Uganda Association of Local Governments and Ms. Agnes Lartey, Secretary General of the National Association of Local Authorities of Ghana. "I feel that for two decades we have made great progress. The role of the local level is being more and more recognised at international level. From the association of municipalities of Mali I represent, decentralisation is also being recognised as prerequisite for development and peace." The discussions must tackle the “who” and the “how” of the agenda. "The agenda represents a big opportunity but also a big challenge for local governments: all goals have a local impact and a large proportion of the objectives and targets are to be achieved at the local level ", stated the local leaders, as well as emphasizing the significant number of targets that can be implemented with local actors (a recent study from GIZ by Professor Misselwitz). The challenge is to ensure sufficient attention is given to the role that local governments will need to play in order to reach that potential. 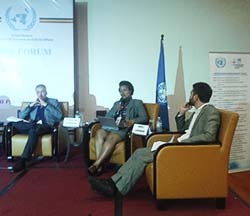 The DCF proposed "a monitoring and accountability framework built on coherent, transparent, inclusive and participatory accountability mechanisms at national and local levels, while elected officials proposed the setting up of "multi-stakeholder platforms that should trigger true inclusion and genuine broad-based ownership”. This would include the participation of other stakeholders such as parliamentarians, CSOs and the private sector. They also emphasised the importance of integrating data. "Being a local level of government, we are not always sufficiently engaged in discussions on the definition of the national development priorities. Abottom-up approach in the definition and implementation of policies remains key." "In South Africa, our national association SALGA, representing all local governments in South Africa and direct interlocutor of the central government, is quite strong. However, this is not the case in many other countries. Therefore, peer-to-peer capacity building between local government associations should be in place, to strengthen the capacity of local government associations to channel the needs of local governments to the central level as input to the national development priorities or country result frameworks." Nomveliso Nyukwana, Mayor of Emalahleni (South Africa) and UCLG Champion, whose municipality is supported through the Local Government Capacity Programme of the Association of Netherlands Municipalities, with which the City of Dordrecht partners to work on local economic development. Finally, it was made clear by UCLG Champions that local governments are facing the challenge of having to deal with many different reporting mechanisms. Every project implemented with external funding has a different result framework and different logic behind it. The UCLG Working Group on Institutional Capacity Building is currently doing a study on the different methodologies of monitoring and evaluation to recommend which reporting mechanism is the most effective to use in local government development cooperation. The review of progress of the 2030 Sustainable Development Agenda by the High-Level Political Forum (HLPF) will take the work of the Symposium into account. The deliberations will also be used in the follow-up process of Financing for Development and contribute to the implementation of the Addis Ababa Action Agenda.